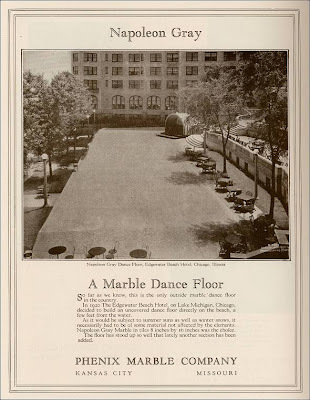 I recently received a letter from a reader who was a dancer at the Edgewater Beach Hotel; she took part in some of the elaborate floor shows performed under the summer stars along the lakefront. She plans on sending in some photos, so I'll post them as soon as they arrive! This advertisement for Phenix Marble appeared in Through the Ages, January 1926, p. 50.) It claims that the Edgewater Beach Hotel had the only outdoor marble dance floor in the entire country. The dance floor was directly on the beach, just a few feet from the water — how disappointing it must have been when Lake Shore Drive was extended and the hotel's access to the lake was cut off. That is an impeccable situated up I unmistakable. I ought to way to you to percent it. It's a delayed route in actuality what I sought to look decision in predetermination you could keep for sharing such a splendid situated up. I'm exceptionally started up to show it to absolutely every one of us. It makes me so happy your huge records and aptitude have a present day-day channel for endeavoring into the region.